An electronic-control throttle that is in fact a world’s first in being adopted on a production motorcycle, on the 2006 R6. The device’s immediate aim is to actively control the volume of intake air being drawn into a high-revving engine in order to control the fuel-air mixture in a way that enables response that reflects the sensibilities of the rider at a high level. Like the fuel injection, the YCC-T system has been developed from the winning technology used on the YZR-M1 MotoGP race bike. Our engineers have made the decision to first use it on the R6 because it is ideally suited to the extremely wide operating range of the new short stroke engine. The YCC-T system optimises the relationship between the engine speed, intake air flow and drive torque curve, to give a smooth and controlled power delivery for such a high revving, high performance engine. The YCC-T features an ECU with a CPU featuring around five times the capacity of the previous model’s unit. In reality, calculations are being performed in this system at the amazing speed of 1/1,000th of a second and control commands are sent at extremely small increments of 1/100th of a second for a very high level of accuracy. This massive processing power ensures that the new throttle delivers outstandingly smooth and highly responsive action. 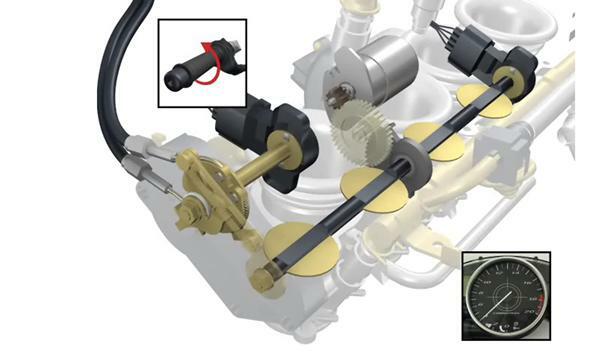 When a conventional throttle is opened suddenly, the amount of fuel delivered to the cylinder head can be excessive, resulting in less efficient combustion processes and reduced performance. However, with the YCC-T system, the ECU constantly processes data from various sensors – including air temperature, intake air pressure, atmospheric pressure, crank position, engine temperature, engine speed, throttle position and oxygen. The data from the ECU enables the YCC-T to control precisely the opening of the throttle valves to suit the prevailing operating conditions, and in doing so it ensures that the optimum fuel/air mix – and therefore higher performance – is delivered every time. YCC-T employs original Yamaha programming. It has been developed specially by an independent Yamaha project team, and the character of the electronic throttle control has been determined by our test riders who have logged thousands of hours of development time. Please see the video for an animation of the system.